1,000,000,000 (one billion, short scale; one thousand million or milliard, yard, long scale) is the natural number following 999,999,999 and preceding 1,000,000,001. One billion can also be written as b or bn. In scientific notation, it is written as 1 × 109. The metric prefix giga indicates 1,000,000,000 times the base unit. Its symbol is G.
One billion years may be called eon/aeon in astronomy or geology. Previously in British English (but not in American English), the word "billion" referred exclusively to a million millions (1,000,000,000,000). However, this is no longer common, and the word has been used to mean one thousand million (1,000,000,000) for several decades. The term milliard can also be used to refer to 1,000,000,000; whereas "milliard" is seldom used in English, variations on this name often appear in other languages. In the South Asian numbering system, it is known as 100 crore or 1 arab. 109 seconds is 114 days short of 32 calendar years (≈ 31.7 years). More precisely, a billion seconds is exactly 31 years, 8 months, 2 weeks, 1 day, 17 hours, 46 minutes, and 40 seconds. About 109 years—a gigaannus—ago, the first multicellular eukaryotes appeared on Earth. It takes approximately 95 years to count from one to one billion in a single sitting. The universe is thought to be about 13.8 × 109 years old. 109 inches is 15,783 miles (25,400 km), more than halfway around the world and thus sufficient to reach any point on the globe from any other point. 109 metres (called a gigametre) is almost three times the distance from the Earth to the Moon. 109 kilometres (called a terameter) is over six times the distance from the Earth to the Sun. A billion square inches would be a square about one half mile on a side. A piece of finely woven bed sheet cloth that contained a billion holes would measure about 500 square feet (46 m2), large enough to cover a moderate sized apartment. There are a billion cubic millimetres in a cubic metre and there are a billion cubic metres in a cubic kilometre. A billion grains of table salt or granulated sugar would occupy a volume of about 2.5 cubic feet (0.071 m3). A billion cubic inches would be a volume comparable to a large commercial building slightly larger than a typical supermarket. Any object that weighs one billion kilograms (2.2×109 lb) would weigh about as much as 5,525 empty Boeing 747-400s. A cube of iron that weighs one billion pounds (450,000,000 kg) would be 1,521 feet 4 inches (0.28813 mi; 463.70 m) on each side. As of July 2016, Apple has sold one billion iPhones. This makes the iPhone one of the most successful product lines in history, surpassing the PlayStation and the Rubik's Cube. As of July 2016, Facebook has 1.71 billion users. A small mountain, slightly larger than Stone Mountain in Georgia, United States, would weigh (have a mass of) a billion tons. There are billions of worker ants in the largest ant colony in the world, which covers almost 4,000 miles (6,400 km) of the Mediterranean coast. In 1804, the world population was one billion. 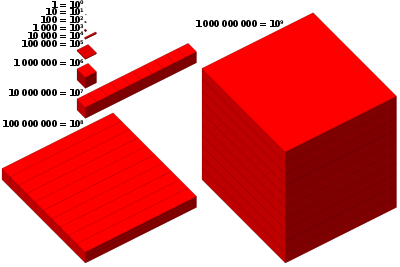 A is a cube; B consists of 1000 cubes the size of cube A, C consists of 1000 cubes the size of cube B; and D consists of 1000 cubes the size of cube C. Thus there are 1 million A-sized cubes in C; and 1,000,000,000 A-sized cubes in D.
1,000,000,007 – smallest prime number with 10 digits. 1,023,456,789 – smallest pandigital number in base 10. 1,026,753,849 – smallest pandigital square that includes 0. 1,073,676,287 – 15th Carol number. 1,073,807,359 – 14th Kynea number. 1,111,111,111 – repunit, also a special number relating to the passing of Unix time. 1,129,760,415 – 23rd Motzkin number. 1,134,903,170 – 45th Fibonacci number. 1,232,922,769 – Centered hexagonal number. 1,234,567,890 – pandigital number with the digits in order. 1,311,738,121 – 25th Pell number. 1,382,958,545 – 15th Bell number. 1,406,818,759 – 30th Wedderburn–Etherington number. 1,631,432,881 – Triangular square number. 1,836,311,903 – 46th Fibonacci number. 1,882,341,361 – The smallest prime whose reversal is both square (403912) and triangular (triangular of 57121). 2,147,483,647 – 8th Mersenne prime and the largest signed 32-bit integer. 2,214,502,422 – 6th primary pseudoperfect number. 2,971,215,073 – 11th Fibonacci prime (47th Fibonacci number). 3,166,815,962 – 26th Pell number. 3,192,727,797 – 24th Motzkin number. 3,323,236,238 – 31st Wedderburn–Etherington number. 3,405,691,582 – hexadecimal CAFEBABE; used as a placeholder in programming. 3,405,697,037 – hexadecimal CAFED00D; used as a placeholder in programming. 3,735,928,559 – hexadecimal DEADBEEF; used as a placeholder in programming. 4,294,836,223 – 16th Carol number. 4,294,967,291 – Largest prime 32-bit unsigned integer. , the first composite Fermat number. 4,295,098,367 – 15th Kynea number. 4,807,526,976 – 48th Fibonacci number. 5,784,634,181 – 13th alternating factorial. 6,210,001,000 – only self-descriptive number in base 10. 7,645,370,045 – 27th Pell number. 7,778,742,049 – 49th Fibonacci number. 7,862,958,391 – 32nd Wedderburn–Etherington number. 8,589,869,056 – 6th perfect number. 9,043,402,501 – 25th Motzkin number. 9,814,072,356 – largest square pandigital number, largest pandigital pure power. 9,876,543,210 – largest number without redundant digits. 9,999,999,967 – greatest prime number with ten digits. ^ "Yard". Investopedia. Retrieved 13 November 2017. ^ "figures". The Economist Style Guide (11th ed.). The Economist. 2015. ^ "6.5 Abbreviating 'million' and 'billion'". English Style Guide: A handbook for authors and translators in the European Commission (PDF) (8th ed.). European Commission. 3 November 2017. p. 32. ^ "How many is a billion?". OxfordDictionaries.com. Retrieved 13 November 2017. ^ "billion,thousand million,milliard". Google Ngram Viewer. Retrieved 13 November 2017. ^ "How Much is a Billion?". Math Forum. Retrieved 13 November 2017. ^ "Cosmic Detectives". European Space Agency. 2 April 2013. ^ Panken, Eli (27 July 2016). "Apple Announces It Has Sold One Billion iPhones". NBCNews.com. Retrieved 13 November 2017. ^ Seethamaram, Deep (27 July 2016). "Facebook Posts Strong Profit and Revenue Growth". The Wall Street Journal. Retrieved 13 November 2017. ^ Burke, Jeremy (16 June 2015). "How the World Became A Giant Ant Colony". Atlas Obscura. Retrieved 13 November 2017. ^ Sloane, N. J. A. (ed.). "Sequence A003617 (Smallest n-digit prime)". The On-Line Encyclopedia of Integer Sequences. OEIS Foundation. ^ a b Sloane, N. J. A. (ed.). "Sequence A093112 (a(n) = (2^n-1)^2 - 2)". The On-Line Encyclopedia of Integer Sequences. OEIS Foundation. ^ a b Sloane, N. J. A. (ed.). "Sequence A093069 (a(n) = (2^n + 1)^2 -)". The On-Line Encyclopedia of Integer Sequences. OEIS Foundation. ^ a b c Sloane, N. J. A. (ed.). "Sequence A001006 (Motzkin numbers)". The On-Line Encyclopedia of Integer Sequences. OEIS Foundation. ^ a b c Sloane, N. J. A. (ed.). "Sequence A000129 (Pell numbers)". The On-Line Encyclopedia of Integer Sequences. OEIS Foundation. ^ Sloane, N. J. A. (ed.). "Sequence A000110 (Bell or exponential numbers)". The On-Line Encyclopedia of Integer Sequences. OEIS Foundation. ^ a b c Sloane, N. J. A. (ed.). "Sequence A001190 (Wedderburn-Etherington numbers)". The On-Line Encyclopedia of Integer Sequences. OEIS Foundation. ^ Sloane, N. J. A. (ed.). "Sequence A054377 (Primary pseudoperfect numbers)". The On-Line Encyclopedia of Integer Sequences. OEIS Foundation. ^ Sloane, N. J. A. (ed.). "Sequence A005165 (Alternating factorials)". The On-Line Encyclopedia of Integer Sequences. OEIS Foundation. ^ Sloane, N. J. A. (ed.). "Sequence A004490 (Colossally abundant numbers)". The On-Line Encyclopedia of Integer Sequences. OEIS Foundation. ^ Sloane, N. J. A. (ed.). "Sequence A002201 (Superior highly composite numbers)". The On-Line Encyclopedia of Integer Sequences. OEIS Foundation. ^ Sloane, N. J. A. (ed.). "Sequence A000396 (Perfect numbers)". The On-Line Encyclopedia of Integer Sequences. OEIS Foundation. ^ "Greatest prime number with 10 digits". Wolfram Alpha. Retrieved 13 November 2017.